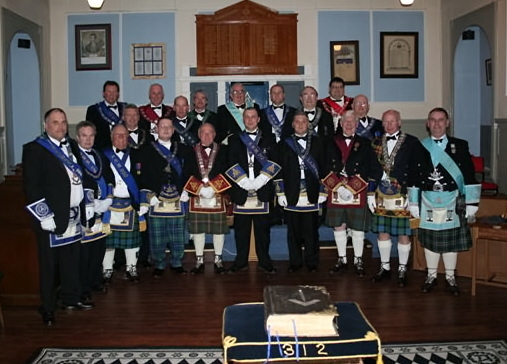 On Friday the 3rd April 2009 the Provincial Grand Lodge of Stirlingshire's Annual Reigning Masters Degree was held in Lodge Bannockburn Bruce & Thistle No. 312. A total of 116 Brethren signed the attendance book which included a deputation from three Sister Provinces headed by the Right Worshipful Provincial Grand Master of Glasgow Brother William Gilmour, in the deputation was the Right Worshipful Provincial Grand Master of Perthshire West Brother Harold Ingram and Immediate Past Provincial Grand Master of Lanarkshire Upper Ward Brother William Landsborough. The Brethren witnessed an excellent working of the Entered Apprentice Degree as worked by the Reigning Masters of the Province of Stirlingshire. All monies raised on the evening will be presented to Multiple Sclerosis Scotland. A presentation will take place in the near future and will be detailed here. The mallet was presented to the Right Worshipful Provincial Grand Master Brother John Mackenzie who thanked the Reigning Masters for an excellent Degree and he also thanked Brother Andrew McKinnon, Worshipful Depute Provincial Grand Master and Brother Alistair Marshall, Worshipful Substitute Provincial Grand Master for their part in the organisation. The musical contribution on the eveing was provided by Brother James Hayworth for which the Right Worshipful Provincial Grand Master thanked him. The Right Worshipful Provincial Grand Master of Glasgow Brother William Gilmour, the Right Worshipful Provincial Grand Master of Perthshire West Brother Harold Ingram and the Immediate Past Provincial Grand Master of Lanarkshire Upper Ward were formally presented and the Right Worshipful Provincial Grand Master Brother John McKenzie presented the three Brethren with Honorary Membership of the Provincial Grand Lodge of Stirlingshire indicating that it was the first time such an honour had been given. The three Brethren thanked the Right Worshipful Provincial Grand Master and the Brethren of Stirlingshire most sincerely saying that it was indeed an honour to receive Honorary Membership of the Provincial Grand Lodge of Stirlingshire.